Congressman Mike Coffman is up for re-election in 2014. He represents our 6th Congressional District here in Colorado. Mike is a veteran, and has served in both the Army and the U.S. Marine Corps. He is distinguished by having resigned his position as State Treasurer of Colorado to serve a tour of duty in Iraq from 2005 to 2006. He was elected as Colorado's Secretary of State in 2006, and then elected to the House of Representatives in 2008. The 6th CD in Colorado is "competitive," and Andrew Romanoff is the Democratic Party candidate. The advertising supporting Mr. Romanoff will not be engaged in enhancing his image. Rather, it will work to denigrate Congressman Coffman, portraying him as a bad person. In marketing parlance, these are "negative ads." This post will chronicle the advertising that is done against Mike Coffman during the 2014 campaign. Let's get started! Steven Hayward at Power Line explains the 97% consensus claim made by LCV. 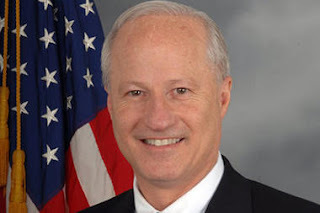 (Male VO): Hello, Congressman Coffman here, just in from Washington. (Female VO): Uh. Hi. Aren’t you supposed to be doing something about that shut down? (Male VO): I’m here to talk about what I’m doing these days. First, I’m working hard to take away your new health care benefits. (Female VO): What? Congressman Coffman !?! (Male VO): That’s right. We’ll put the insurance companies back in charge of your health care. (Female VO): You’ve got to be kidding me. (Male VO): Oh we’re dead serious -- so serious that we shut down the government over it. (Female VO): Congressman Coffman -- that’s just irresponsible. And, well… reckless. Oh, and what happens to your health care? (Male VO): Oh, don’t worry about me. Voted myself taxpayer-funded healthcare for life! So I’m taken care of, but thanks for your concern. (Female VO): Paid for by the Democratic Congressional Campaign Committee, www.dccc.org. Not authorized by any candidate or candidate’s committee. The Democratic Congressional Campaign Committee is responsible for the content of this advertising. June 2014 - The VoteVets Action Fund is a 501(c)(4) organization chartered to focus on nonpartisan education and advocacy on behalf of veterans and their families. While billing itself as non-partisan, VoteVets.org is the largest progressive organization of veterans in America. It has released this ad which characterizes Representative Coffman as being insensitive to veterans. While the ad says that Mike Coffman "voted against troop pay," it fails to note that the vote came on the National Defense Authorization Act, which covers diverse social issues such as Marriage and Civil Rights as well as the overall budget for national defense. Characterizing Mike Coffman as being anti-military is a stretch, but the Democratic Party shows how it is done. September 2014 - CounterPAC tells us Mike Coffman takes political contributions from unknown sources, that might include Russian oil billionaires, Too-Big-to-Jail Wall Street Bankers and a Chinese Casino Owner! September 2014 - The Democratic Congressional Campaign Committee teaches us that Mike Coffman is a threat to women. October 2014 - Erica Payne and the Agenda Project use the outbreak of Ebola to demonize Republicans. The ad flashes a picture of Mike Coffman (at 44 seconds from the beginning) and warns us that Republicans are killers. October 2014 - The Andrew Romanoff campaign continues the "War on Women" narrative against Congressman Coffman. November 2014 - Mike Coffman wins re-election 52% to 43% over challenger Andrew Romanoff.